. . . . . . A place to contribute, exchange tips and ideas and find further info on the LDC group on Meetup. It started in Devon where I was looking for some denim to make some trousers and visited Malbers Fabrics. I came across exactly the fabric I wanted but, woe, there was only 80 cm left on the roll. However the retailer offered me a good price to take that remaining fabric so how could I resist? I did not intend to make anything with it immediately but an attempt to draft a skirt for use with a particular fabric did not work out so I was wanting a quick make as a form of solace and set about thinking how I could use that denim. I had a pattern that I had hacked many times, very simple - just 2 pieces- back and front and 2 darts to each piece. I also had a splendid open-ended zip, silver with flashes of pink, green and yellow, just begging to be show-cased somehow. That's why I thought of making a slim skirt with a zip front. Easy! easy!- just add a grown-on facing to the centre front of the skirt and insert the zip down the front, instead of a short zip at the left side as I usually did. So I just squeezed the adapted pattern on to the available fabric and cut it out. When I had sewn the darts I realised that I had adapted the back instead of the front- the pieces look so similar and my writing in pencil on the pattern pieces had faded from age and use (as had my eyesight). I thought "Why not have the zip at the Back?" Because it is not comfortable to sit on and might break under stress from my fidgety backside, that's why. Why not have a centre back seam and cut out another front piece? Because I only had scraps left, that's why. Pockets! Jiggling around with the remaining scraps I managed to cut out 2 small pockets, just big enough to get my hand into. However plain pockets seemed to be rather boring and I wanted a quick, simple embellishment. Recently Ana of Coco Wawa Crafts generously had given me a lovely enamel pin as a present for the tiny bit of help I gave her with a knitting project. I love it and it made me think that a pink heart would be a ideal motif, especially because the zip has hints of pink in it. Doesn't the pin look good? I love the idea of proclaiming your allegiance to a craft via a pin. I had some Gutterman thread in varying shades of pink so I used this to decorate the pockets and to top stitch along the zip sides and at the hem line. However I do fear that the skirt may run in future washes, though I did pre-wash it, and the pink stitching may be obscured by blue dye then. Time, and the washing machine, will tell. Instead of a separate waistband or a facing I simply applied curved petersham to the top of the skirt. This meant that, before I sewed up the side seams, I could gauge the diameter of my waist simply by looping the petersham around myself, marking where the waist band should begin and end. I could see then if I needed to take in or let out the side seam allowances for the skirt to fit at the waist before I sewed up the side seams. The zip comes up to the top of the waist and to make the fastening doubly secure I extended the petersham on the left hand side and placed a snap fastener to prevent the zip opening accidentally if it came under stress. I am so pleased with this skirt, especially when I realised how well it went with the cowl-necked Freya top that I made last year from Tilly and the Buttons book "Stretch". I may look grim in the photo below but really I am very satisfied. A post of tips - anything you wish someone had told you when you started to sew, that you figured out yourself since! If you're new to sewing with a machine and you find that your seams are wobbly: keep your eyes on the edge of the fabric as it goes through under the sewing foot. I remember that when I first started I stared at the machine needle - but looking at the fabric edge gives you a more even result. When you have a narrow collar or buttonband, or any similar pattern piece, that you need to sew to something at its narrow end - sew those seams first. If you leave this until after you sewed the longer side, it is incredibly difficult to get the angle right. The narrow end is likely to slope in one direction or other and will be too long or too tight. As a result, the garment will look less well sewn. I did a blog post about this one. It is easier to attach pieces like a patch pocket, a pocket flap, collars, etc... to a pattern piece when it is still flat and hasn't been sewn to many, if any, other pieces. The sewing instructions that come with your pattern may have you do these kinds of pieces last but that makes it more difficult. Put pins in perpendicular to the fabric edge but don't match the fabric pieces' edges. The piece with the longer outside curve will need to pucker a little at the edge to make sure that the stitching line (the seam allowance's distance away from the edge) of both pieces gets pinned together. You can get teh fabric pieces to lie flat when you hold them between a finger and thumb at the stitching line and make sure they are smooth and flat to the previous pin. It takes a bit of trial and error but you'll get there! These are really tricky. Mine often produce these little diagnoallyu dragging lines from the folded edge to the stitching line - because one of the fabric layers shifted away from the other layer. Basting the hem may help; you can try a walking foot; or at the very least using lots of pins! Set into the fabric perpendicualr. If you still have problems: do baby hems instead! When it is tricky to sew over the bit where one fabric layer has a seam (you get loads of those when sewing patchwork! ), then use a tailor's awl to hold the seam allowance down so you can sew smoothly over this bit. A tailor's awl is a straight spike with a handle at the end. It saves your fingers from going too close to the machine's needle. Don't use your fingers too close to the needle, it's not worth it. It is tempting to sew over the pins where they hold the fabric layers together. It is safer to pull each pin as you approach it. You can either stop stitching to remove each pin, or if it is a long straight seam and you're going slow, you may be able to remove pins before you get too close to sewing over them (and before the screw at the side of the machine foot comes plunging down onto your poor fingers). If your needle ever hits a pin straight on, the machine needle can break at the neede's eye and the pointed end will fly off at a high velocity. You really don't want it ending up in your eye, take time to pull the pins instead. Much safer. What tip would you give yourself if you could go back in time? Please post in the comments! 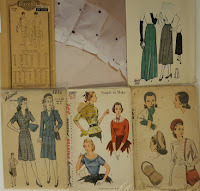 We were going to post more links to sources of sewing inspiration, as mentioned in the previous blog post. This post suddenly focussed on capsule wardrobes. I like going with the flow, so here goes! "I never manage to follow a blog but I do Facebook. One of the groups on there 'Capsule Wardrobe Sew Along' I really recommend - loads of inspirational people planning simple capsule wardrobes entirely self sewn. A strict no nastiness policy lends to a really supportive and positive group and people's work ranges from amazing to nearly as basic as me. I like the idea of working on key pieces per season that you can mix and match, updated a few pieces per season. For an erratic and not very confident sewer like me it seems almost attainable! 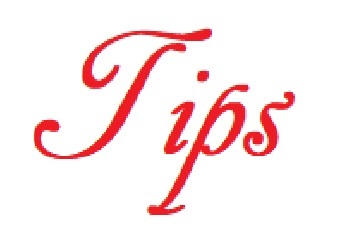 People post all kinds of problems or fit issues and loads of lovely people offer great advice and suggestions. People also ask for recommendations and opinions on patterns and fabrics and there is loads of inspiration. So good to see the work of other home sewers not quite up to the professional standard of a blogger but enjoying their sewing like me." Here's a Google search result that takes you straight there: Capsule Wardrobe Sew Along on FB. The most recent blog post on this blog is from 2017 but the ideas are still great. Pick and chose what makes sense to you. Sewing with Sarah also has a fantastic post on capsule sewing. There are lots of photos (love a blog post with lots of photos!) so this is very visually inspiring. Sarah came to sew for a capsule wardrobe after she noticed having many fabrics in colours that went well together. If that's not a good reason, I don't know what is! When I think about sewing for a capsule wardrobe, I don't think of sewing all the various items. I look at what clothes I have in order to decide what the gaps are. Do I have enough work skirts, could I do with a mid length cardigan (because my most beloved one has gone to cardie heaven! Sneeef...), or could something like a waistcoat in a fantastic print pull outfits together...? I very much want to focus on just one item at a time, trying to do lots just piles on way too much pressure, and that in turn makes me stop sewing altogether. An outcome strictly to be avoided! So I focus on one thing (though I admit that I don't finish that one item before another project catches my attention. Bad habit that. But I'm sewing!). What is your experience with a capsule wardrobe? Any insights, thoughts and comments - what are your recommendations? Please leave Samantha and me comments, we appreciate it very much. At our monthly London Dressmakers Club meetings we often mention sewing blogs or other sources of sewing inspiration that we like. We all like different ones and haven't all come across the same ones, so it would be lovely to spread the joy and list one source each that other members (and non-members) may enjoy too. I hope we will do more posts like this one. Let us know in the comments if you read any of the listed blogs - or even better: tell us if you want to write up your favourite in a future sewing blog post (yes please!). We would like lots of people to contribute to this members blog. It is all about the more the merrier! Please share - one paragraph and the link is all that's needed. I am being greedy and giving more than my fair share of reccomendations, and I could do many more, but here are 3 of them - Barbara. It is the blog for the legendary Mood Fabric store in the USA. They have the most amazing free patterns to download (for women mainly, but also for men and children) but I am not really sure how to subscribe to this from their site. I used to have to keep checking for new blogs every so often but I have accidentally managed to subscribe to it today via Bloglovin. The link should be here. This is a vlog rather than a blog. The lovely Nikki and Rachel run a sewing school in Sodbury, near Bristol, and even though you might not get to their school you can still get loads of advice, reviews, fabric hauls and inspiration from their vlog. They are just as friendly and chatty in the flesh as on the screen- they do come to London sometimes and I have been able to admire the creations they have been wearing IRL. They sew the sort of garments I would make for myself - if I had a bit more flair and colour sense. And this one is a podcast. An hour or more each Friday of bubbly chat from Gabby (Gabberdashery) and Megan (Pigeon Wishes) and their guests of the week who are people whose blogs you may well read or whose independent businesses you buy from or otherwise involved in the sewing world. 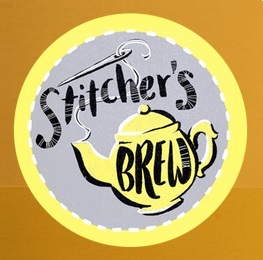 It is like eavesdropping on a stitcher's tea party and just the thing to listen to while seated at your sewing machine- preferably with a mug of tea and a bit of cake to hand- and hear the behind the scenes stories. She uses quite a few Burda patterns and her garments are often very interesting but entirely wearable. There is one from the July edition of Burda Style that she refers to as #113 Knot Dress. It has a very intriguing round "cut-out" that gets gathered up with a bow. I am fascinated by pattern details like that! She makes all kinds of garments: dresses, blouses, coats, trousers, you name it. I am very jealous about the fit she achieves! I also enjoy reading about all kinds of patterns and garments that Catherine sees at exhibitions, and the many fantastic photos she posts. She writes about some of the many vintage patterns she owns. What I love the most is the amount of details of some patterns: sometimes it is the cut of a garment but it can also be a design element like a collar or vent or a neckline, or some intriguing gathering... there is such a lot of interest there. I am very glad that Catherine writes her blog! She is also one of our members. I guess you can see a bit of theme here! There are quite a few more that I love reading, I'll save them for the next post like this! We want to post more like this one. Part II is to follow soon! Cakey (Katie) - loves sewing, reading and thinking about sewing - now also writing about sewing!